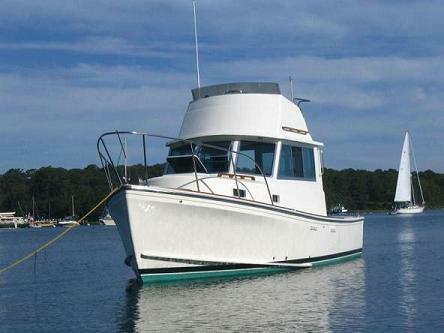 I purchased this 1988 Cape Dory 27 Flybridge Cruiser in July of 2004. She had been on the hard for nine years, according to the previous owner due to a variety of circumstances. I would suggest that "NEO" is in all likelihood the nicest Cape Dory in the World, unless someone else has done the same retrofits that I have. With the exception of the Volvo TAMD41A which has approximately 700 hours on it, everything else has been renewed. I am selling her as I am moving down to a trailer-able boat. She currently is stored inside in Portland, CT and is scheduled to come outside in May for commissioning. If you are serious about a Cape Dory 28, I urge you to look at the others for sale and then look at NEO. Every exterior portion of the boat has been awl gripped, including the nonskid. This was done with all hardware, railings, ports, deck fills, flying bridge and windows removed. As the pictures indicate, all gel coat crazing was properly ground out so that they don't reappear. All new windows (American Windows out of FL) were installed as were all beckson ports. All new 5/4 teak grab rails were manufactured and installed. Complete interior varnished with 5 coats of epihannes. Installed ash ceiling strips in V Berth. All new fuel hoses, fill & vent. All new water hose, fill & vent. All new s.s deck fills. All new s.s thru hulls. Re-bedded the swim platform and installed backer plate fender washers. All exterior teak renewed with sikkens cetol. Boat stripped down to the gel coat, and SIX interlux 2000 barrier coats applied. New custom built holding tank (55-60 gal) with Sealand pump. All new hoses and valves. All new engine room vents & hoses. All new Steering Helms and Ram and fluid. All new engine hoses & o rings, new antifreeze, removed and flushed out heat exchanger. New Depth sounders and knot meters both stations. New VHF Radio & Repeater for Flybridge. Custom inserts in teak treads on Flybridge ladder and cockpit corner steps, as well as hinged storage box in galley. New Formica on Salon table. New wind screen for the FlyBridge.